On top of Colin Kaepernick's lackluster performance against the home team Miami Dolphins on Sunday, the 49ers quarterback rubbed some people the wrong way with his off-field comments, the latest of which defended late Cuban leader Fidel Castro. When Kaepernick took the field on Sunday, boos proved again that the NFL star is now one of the league's most polarizing figures. Earlier this season, Kaepernick sported a t-shirt capturing the meeting between Castro and Malcolm X in 1960. A Miami Herald reporter whose parents emigrated from Cuba grilled Kaepernick last week for wearing the shirt. 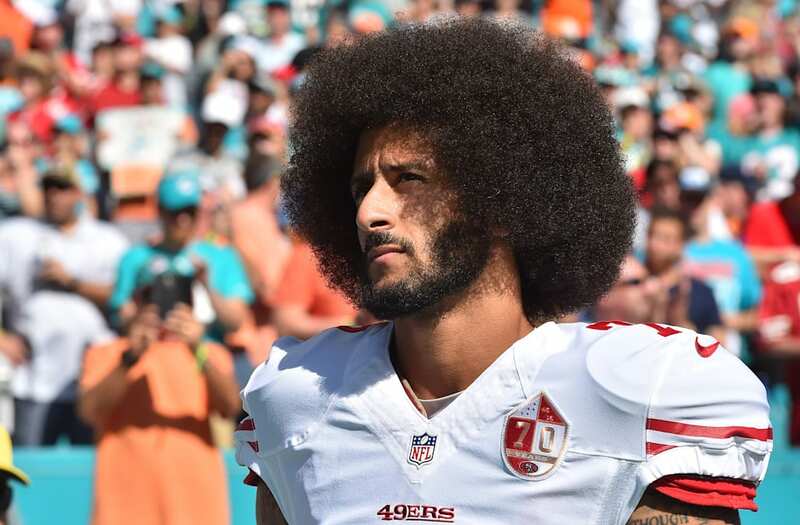 The reporter accused Kaepernick of dodging questions about Castro when the quarterback spent most of his answers discussing Malcolm X.
Kaepernick responded by saying, "One thing that Fidel Castro did do is they have the highest literacy rate because they invest more in their education system than they do in their prison system, which we do not do here, even though we're fully capable of doing that." The back-and-forth continued, but it was enough for the reporter to call Kaepernick an "unrepentant hypocrite" for defending Castro while espousing the American virtues of free speech during his recent protests of police brutality. Miami fans appeared to echo that sentiment during Sunday's win over San Francisco. Of course, Kaepernick is no stranger to backlash this season. The quarterback has kneeled during the national anthem in protest of American racial inequalities. A number of athletes (including some Dolphins players) have followed his lead. He's also received death threats, taunts from fans and heated responses from Ruth Bader Ginsburg and Stephen A. Smith. Kapernick clarified his comments about Castro after Sunday's game. "What I said was I agree with the investment in education," Kaepernick said, per USA Today. "I also agree with the investment in free universal health care, as well as the involvement in helping end apartheid in South Africa." "Trying to push the false narrative that I was a supporter of the oppressive things [Castro] did is just not true," Kaepernick continued. "I said I support the investment in education." Kaepernick beat the Dolphins back in 2012, the season he emerged as San Francisco's dominant young quarterback, rushed for 181 yards against Green Bay in the playoffs and led the 49ers to the Super Bowl. That Kaepernick — and that San Francisco team — is gone. The 49ers are 1-10 this year and Kaepernick isn't putting up the numbers he used to. These days, he's the NFL's lightning rod for a much different reason.